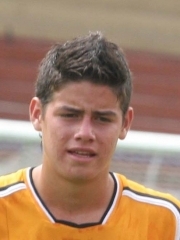 James David Rodríguez Rubio (born 12 July 1991 in Cúcuta) is a Colombian footballer who plays for Portuguese team F.C. Porto. It is considered by many Colombian journalists as the successor of Carlos "El Pibe" Valderrama and is currently one of the best young players in the world. Rodriguez started his professional soccer career in 2006 at the time of his Colombian second division club Envigado FC, ​​with whom he made the 2007 ascent. In 2008 he was signed by Argentine team Club Atlético Banfield, where he made his first team debut on 7 February 2009, he scored his first goal for the club on 27 February with a long range strike in a 3-1 victory over Rosario Central. In 2009 he became a regular first team player featuring in every game of the Apertura 2009. His second goal for Banfield came on 26 September when he scored with a strike into the top corner from outside of the area in an important 2-1 against Newell's Old Boys, a win which helped Banfield to win the Argentine championship for the first time in the history of the club. For the Clausura 2010, 13 February 2010, James scored a golazo in the match against arch rivals Lanús with a left-footed lob to make the game 2-0 in the final minutes. After the game daily sports website Diario Olé likened his playing and personal style to Cristiano Ronaldo and also nicknamed him the 'James Bond of Banfield'. James added to his glowing reputation with a goal in the Copa Libertadores group game on 17 February 2010, in a demolition of Deportivo Cuenca away from home, Rodriguez scored the fourth goal of the game with a nice cool finish in the area on his left foot. Banfield thrashed them 4-1. His wonderful scoring season continued with a brace in the Copa Libertadores group game on 10 March 2010, in an away match with Uruguayan giants Club Nacional de Football, James scored once with a diving header and again from the penalty spot on his right-foot in the game which ended 2-2. The 18 year old netted another goal on 29 April 2010, in the second round match of Copa Libertadores 2010 in the first match versus Brazilian giants Internacional which Banfield won 3-1. bringing his tally to 5 goals in 7 games but the international season ended in defeat as his team went down on away goals losing 2-0 in Porto Alegre in a game which Rodriguez was also red carded for two fouls. On 6 July 2010, he was signed by F.C. Porto for €5.1 million, with 30% registration rights retained by other parties. He signed a 4-year contract with a €30M release clause. On 18 July he played his first game and scored his first goal in a friendly against Ajax. In November Porto sold 35% economic rights (half of 70%) to Gol Football Luxembourg, S.A.R.L. for 2.5 million. James also scored a hat-trick in Portuguese Cup Final against Vitória de Guimarães in a 6-2 win of Porto. On 17 May Porto bought the remain 30% rights from Convergence Capital Partners B.V. for €2,250,000. On 13 June he signed a new 5-year contract and the release clause had increased to €45 million. Whole or part of the information contained in this card come from the Wikipedia article "James Rodríguez", licensed under CC-BY-SA full list of contributors here.